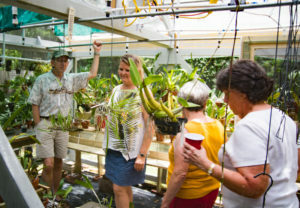 I started the 2017 JOS Greenhouse Tour Season by hosting it at my home on Fleming Island. We had 21 attendees and two birthday guests – Stacey Schwab and John Van Brocklin. 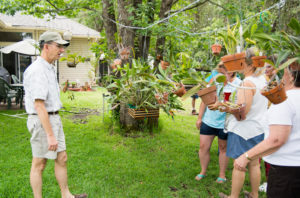 The tour was conducted from 1 to 3 PM and during that time, I shared how I have my orchids distributed in my greenhouse and hung in the trees in my back yard. I built the greenhouse last year over the period of several months. Active construction took place on weekends, with the only help I received being when neighbors helped me stand up the sides. Construction consisted of 6 foot 4×4 inch treated lumber posts floating on flagstones at the corner, with all other structural elements being 2×4 inch treated lumber. The roof is peaked with a 2 1/2 foot rise at the center and roofing is corrugated polycarbonate. The greenhouse is b uilt as a shade house and replaces two smaller “pop-up” (plastic tent) greenhouses that time and the elements had degraded. More importantly, last July I measured the temperature in one of the greenhouses at 110F, even though I had a fan running and the plastic greenhouse was under Aluminet shade cloth. I quickly cut out the sides of the greenhouse with my knife and the temperature immediately dropped to 90F. Knowing that heat is always a problem for Florida greenhouses, I resolved that I’d build a ‘winterizable’ shade house, rather than a traditional fully-enclosed greenhouse. Design constraints. The covenants in my neighborhood limit type and size of structures that can be placed in a backyard. In addition, the available site for the greenhouse is sloped. 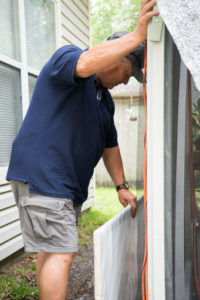 As a result, the greenhouse is a “temporary” structure that rests upon garden pavers at each corner, with stacked pavers on the downhill side leveling the structure. I can also tie in ground anchors if desired, but found that Hurricane Mathew had no effect on the greenhouse whatsoever due to siting and weight. The greenhouse is a ‘winterizable’ shade house that is fully screened in order to keep out the squirrels, cats, and birds; not to mention other 4-leggged animals. When temperatures drop below 60F, I install wood and plastic (6mil thick) panels (Thanks to long time JOS member Ed Cavin for that idea!) to make the greenhouse weather tight. I also have two 1500 watt heaters in the greenhouse, but last year did not have to run the heaters at full capacity. Water and electricity. All electrical outlets are above the misting system that I’ve installed in the greenhouse and drive two 20 inch box fans on a timer, and two thermostatically controlled heaters. I have also installed four individually-timed watering circuits that deliver mist at the location, time, and duration appropriate for the orchids in that location. Flooring and orchid benches. Flooring for the greenhouse is contractor sheeting like that found in commercial nurseries. I put down four layers and after 9 months have yet to see any thing pushing its way through. I have three orchid benches in the greenhouse. One is 10 feet long and consists of a 5-step tread-way tied together with 1×6 inch planking. My thanks to JOS member Eric Cavin for that inspiration. I saw this approach used in his greenhouse and always liked it. I also have two 6 foot benches that are built around 24 inch wide wire shelving purchased a Home Depot. I’ve also repurposed several plastic shelves to provide space for most of my Phalaenopsis orchids. Overhead I have four 10 foot sections of 1/2 inch galvanized pipe from which to hang orchids when everything comes inside as night time temperatures drop below 60F. ough to attenuate the direct sun at mid-day. I have two chains hung between two trees about 30 feet apart. Rather than cable between trees, I used chain because their links will keep orchids exactly where I hang them. 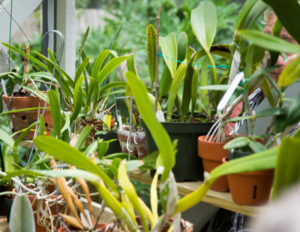 I hang all of my vandaceous and Schumbrukia orchids from tree limbs situated to receive ample morning sun, but to be protected from the hotter mid-day and afternoon sun. In addition, I’ve also placed two sprinkler heads to water the vandas daily.